I turn into a crazy dog lady, then don't post for over 2 months. Coincidence? I think not. We are still fostering Bruiser. For the many people who have been asking/wondering... No, we are not adopting Bruiser. We love him to pieces and believe that he is a great dog, but we think he would do much better in a home where the owners are around more often. We have learned a lot about Bruiser in our time together and his behaviors show signs of previous abuse and neglect. He gets really bad separation anxiety while we're gone, worrying that we won't come back. And whenever we do come back, he's terrified that he's in trouble (regardless of whether he is actually is in trouble or not) so cries and hides for several minutes. Other than those few minutes every day, he's amazing and showers you with love. If you know of anyone looking to add a small friend to the family, let me know! We would love to have someone in the EC area adopt him so we can possibly stay in touch with him and get together for puppy play dates! Since we don't know Parker's history, we were not given a birthday or even an age. The vet was able to estimate his age according to his teeth so we're told Parker is about 10 years old. But this Wednesday, we are celebrating Parker's 1st Adoption Birthday :) It will be one year since we picked him up from the Humane Society and there hasn't been one MINUTE that I have regretted it. He's my everything! So, that's an update on the pups folks! Have a happy day! Welcome to Life After Morning Coffee! My name is Missy and I'm a 25 year old newlywed living in Wisconsin. I'm a mama to two rescue pups, a coffee addict, and have lost almost 50 pounds! This blog follows my life as I try to maintain a healthy and happy lifestyle. 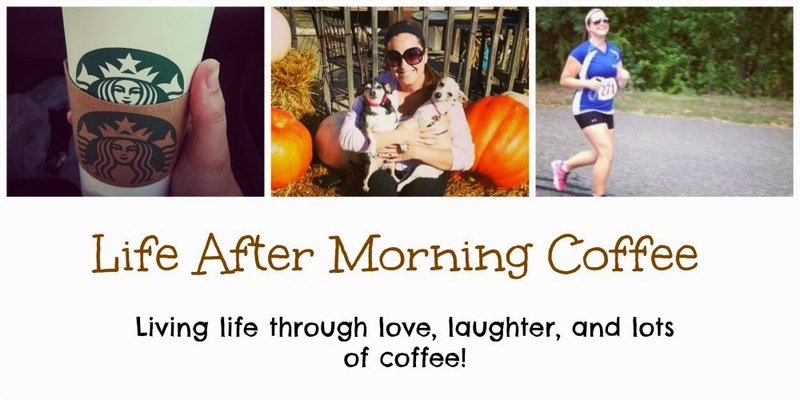 Feel free to contact me at lifeaftermorningcoffee@gmail.com!